GATOR MAXX G2 is made with a state-of-the-art manufacturing process. Specifically, calibrated sand is mixed with sophisticated intelligent polymers. This new generation of Intelligent Polymers neutralizes haze and dust. The polymeric sand application is now dust free and haze free. No blower is needed and the intelligent polymeric sand requires only one watering. 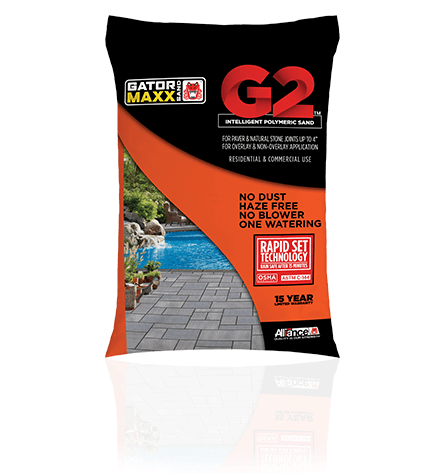 GATOR MAXX G2 is recommended for a variety of uses including pool decks, patios, footpaths, driveways, parking spaces, pavements, etc. Available in Beige or Slate Grey. Gator Dust Bond is a unique mixture of polymer binders and calibrated stone available in Sahara Beige, Stone Grey. 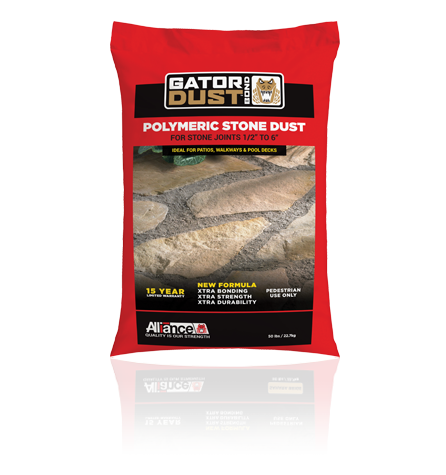 Once Gator Dust Bond sets, it becomes very firm and locks between the stone joints while still retaining flexibility and providing a long lasting, durable jointing material. Gator Dust Bond is recommended for a variety of uses including pool decks, patios, footpaths, and any other pedestrian applications. Available in Grey or Beige. Alliance Gator Base eliminates the need for excavation to save time and money on your next hardscape project. One Gator Base panel is equivalent to 6˝ of crushed stone. The inter-locking panels distribute all dynamic loads to a very wide area practically eliminating any pressure on the ground. The foam panels are also a more effiecient insulator, further reducing the potential damage of freeze and thaw cycles. Gator Base will never leach chemicals and is guaranteed not to degrade for well over 100 years. Gator Nails are used to secure paver edging firmly against the block they are meant to retain. Comes in 10" length and 175ct per 50lb. box. SEK-Snap Edge restraints secure the hardscape system and are a necessity in any hardscape project installation if you want it to look beautiful through the years. To avoid the high cost of paver edge restraint failure and ultimately protect your reputation, carefully consider the many factors that affect the edge restraint’s performance over the lifetime of a paver project. Quality makes the difference! Masonry adhesive is the ideal alternative to using mortar to bond bricks, pavers, steps wall blocks and caps together. Some major benefits include ease of use, quicker cure time and a durable, invisible bond. SEK-Surebond offers masonry adhesives that can be used in less than ideal situations such as extreme cold, damp materials and in areas that experience freeze thaw cycles.